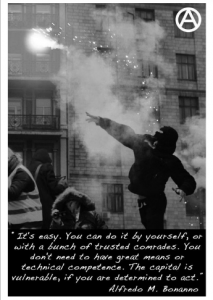 100 Poster3 DIN A3 (29,7 x 42 cm) with Quote of Alfredo M. Bonanno: “It’s easy. You can do it by yourself, or with a bunch of trusted comrades. You don’t need to have great means or technical competence. The Capital is vulnerable, if you are determined to act.”. All profits of this product will be used to finance our independent reporting and Info-Café. 100 Posters DIN A3 (29,7 x 42 cm) with Quote of Alfredo M. Bonanno: “It’s easy. You can do it by yourself, or with a bunch of trusted comrades. You don’t need to have great means or technical competence. The Capital is vulnerable, if you are determined to act.”. All profits of this product will be used to finance our independent reporting and Info-Café.